Orthodox chants performed by Mixed Choir. Soloists: Y.Ilieva-alt, I.Tsaneva-mezzo-soprano, S.Atanassov - bass, B.Spirov - tenor. Grechaninov is among the most famous Russian masters of Church Orthodox music. A pupil of Tchaikovsky and successor of an ancient and great Orthodox tradition, he has written dozens of works based on ancient chants, sung from centuries ago to the present day. What is characteristic of his music is his desire of striving to modernize by means of compositional techniques the old church music by elaborating the motifs and adding diverse harmonic nuances and rhythmic phrases. Thus the ancient melodies come to life and resound in a new way. The release includes nine Orthodox liturgical chants, harmonized with mastership and subtlety for a mixed choir. Each of them is a setting of an Old-Slavonic ecclesiastic text, for which Grechaninov, according to the time of performing the chant and its type, has used an individual approach in the elaboration. Thus, for instance, in Oh, Gladsome Radiance he introduced soloists, polyphonic episodes and chorales, which are alternating according to the meaning and idea of the words. On the other hand, in Blessed Is the Man he divides the chorus in two groups, in accordance with the old church cannons: the first takes the lead of the psalmodic recitation while the second replies with the refrain: "Hallelujah". 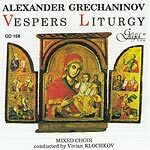 The mixed choir, conducted by Vivian Klochkov performs with reverence and exquisite sound the chants, which bear not only the Christian ideals and faith in God, Jesus Christ and Our Lady, but also the inspiration of a remarkable musician and master of choral writing. 1 Bless the Lord o , my soul 5'29"
2 Blessed is the Man 4'36"
3 O, gladsome radiance 4'05"
4 Rejoice Virgin ,Mother of God 1'17"
5 Prase Ye the Name of the Lord 5'58"
6 Troparia of Resurrection 7'25"
7 Since my youth onwards 3'00"
10 Thanksgiving to the Mother 1'36"